Developer: Ready At Dawn Studios. 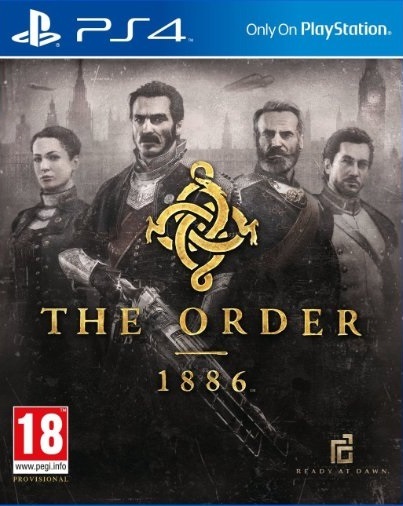 Seemingly one of the hottest new properties of 2015, The Order 1886 became buried under negative press shortly before its release after a leaked playthrough hit the web. It appeared to be short, padded with cut-scenes and filled with other clichés such as quicktime events. And unfortunately for Ready at Dawn, a normally-reliable developer, their work seems to reflect that. At times a thrilling shooter, while at others completely dull and devoid of originality, its stunning visuals do not make for a great game, and nor do they make for a very lengthy one at that. It’s a shame, because the setting and concept is wholly unique. Taking place in Victorian-era London, you assume the role of Sir Galahad, a member of the elite Royal Knights who serve to protect the city. Armed with potent steam punk weaponry which gives the Knights the edge, the looming threat of Lycans and rebellion is beginning to consume the city. But is all as it seems? There’s some obvious twists along the way, but Galahad and his knights are well voiced, captured and have a bit of personality to them. Though you don’t really care where the story goes, per se, you care what happens to the individuals. Part movie, part game, The Order 1886 doesn’t quite get the balance right. A single-player only shooter, you simply progress from chapter to chapter, either killing anything in your path or – in many instances – watching cut-scenes. Unskippable to the end, you do a lot more watching than you do playing, and while the production is there, you start to pine for some actual combat. And when you’re not bombarded with cutscenes, some of the more rote gaming mechanics begin to weave in. There’s an abundance of QTEs throughout the game, none of which bring you into the experience or feel significant. It’s just a part to make sure you’re still awake. "I'm not sure I heard right. I could have sworn you said £55 for a minute!" It’s a shame you do so little time shooting, as The Order 1886 plays quite well in these scenarios. Though derivative of most cover-shooters, its crisp mechanics and smooth shooting ensure you never feel frustrated. And the weaponry is an absolute treat. Along with some of your more typical weapons – like pistols, shotguns and assault rifles – you also use a couple of nifty tech weapons. The Thermite Gun allows you to shoot flammable dust, and then set any immediate foes on fire. The Telsa gun lets you electrocute enemies, and you even gain access to a powerful, steam punk rocket launcher. AI is pretty good, and the set pieces are designed to test you, meaning combat actually gives you a challenge. But, you could count the number of combat scenarios on your two hands. The Order 1886 tries to keep things fresh as you go along. There are some pretty heated battles you partake in against Lycans, who prove a fairly tougher enemy in the game until – sadly – you can figure out their pattern pretty quickly. More damning are the insanely overpowered Shotgun enemies, who can not only take you out quickly but also prove a tough time to kill. Galahad does come equipped with a vial of Blackwater, essentially allowing him one chance to stand back up after dying, but of course, enemies are able to take you down before said consumable is used. It serves its purpose of keeping you playing, ensuring combat doesn’t stop you from taking in the game’s story, though in fairness it never really becomes a crutch. There are also a few sequences where Galahad must inspect his environment to find clues to progress, but these prove tedious as you rotate around objects until something happens. As little balance as it has in its gameplay, the real killer is The Order 1886’s poor length. For the best players, you may not even reach seven hours of length before the credits roll. There’s a choice of three difficulty levels, but they don’t exactly entice multiple playthroughs. Collectibles are scattered throughout the game, and while they offer some back-story into the game’s world, you won’t be jumping out of your seat to find them. As a full priced retail release, also featuring no multiplayer of any kind, the short campaign is damning. "In my day, gaming was three-button pads and Trinitrons!" It’s clear that the production was a key focus for The Order. As routine as it becomes watching cut-scene after cut-scene, they remain stunning throughout. Characters are rendered and animated with more detail than any before, thanks to some great use of motion-capture technology. Environments are rich in texturing and well-coloured, featuring some insanely beautiful vistas that make your jaw drop. The frame rate never dips under pressure, and the lighting is just right. It may be the best looking game to date. The audio is just as strong, with a fitting soundtrack, great voice work and potent weapons. In the end, The Order 1886 makes for a great showcase of the system’s graphical capabilities, but not its gameplay potential. It is admittedly a rock-solid, potent shooter at times, but one which never lets you enjoy those sequences. Instead, you’re forced to watch cutscenes after cutscenes, sometimes partaking in QTEs to keep you going. It’s a crying shame, because the potential of The Order’s weaponry, setting and story just feel a touch untapped. And with only a few hours of gameplay at £55, it proves a tough sell for value-conscious gamers. Might be worth a punt when it’s cheaper, but for now there’s better alternatives for your money.